The prophecies of Jeremiah offer us a unique insight into the mind and heart of one of God's faithful servants. Read more about the book of Jeremiah. Jeremiah wasn't the brightest among the prophets; Isaiah held that distinction. And the book of Jeremiah isn't the most difficult to understand—that award probably goes out to Ezekiel. Neither is Jeremiah the most influential (that’s Daniel) nor the most notorious—Jonah, without a doubt—or even the most to be pitied (hello, Hosea). 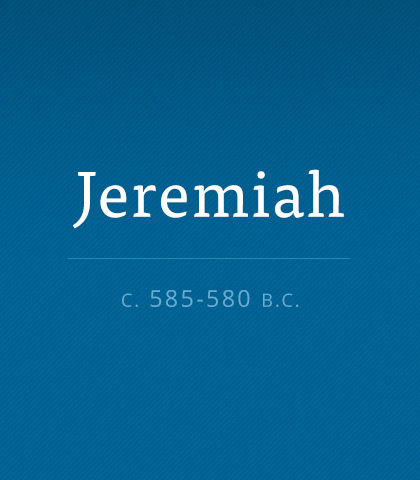 But of all the prophets, for sure, Jeremiah was the most heroic. There are billions of people on this earth, but there’s only one you. You’re the only one with your skills, your appearance, your touch, your voice, your style— you’re the only one. With every surprise and opportunity God also brings answers for our fears, objections, and defences. Here are four promises God’s answers offer us. We can use a lot of energy and resources in our lives to build up our internal sense of worth or to form an identity for ourselves. Who we believe we are defines how we behave. Puritans used to speak of “following hard after God” and “setting our faces like a flint toward God.”—Strange-sounding phrases in today’s fast-paced world! But these words need to be remembered, especially in our generation. Those who successfully wage war with silent heroism under relentless secular pressure—ah, they are the saints who know what it means to be melted. God did not give us His Word to satisfy our curiosity; He gave it to change our lives. Can you name a couple of specific changes God has implemented in your life during the past six or eight months? Those who flex with the times, who refuse to stay rigid, who resist the mould and reject the rut…ah, those are the souls distinctively used by God. We’re prone to treat the Bible like a textbook and we’re cramming for a test. We know how to read, analyze, colour code, timeline, and graph the Scriptures, (all good!) but meditation is a neglected skill. When you hear something nearly true, or partly true, it’s easy to accept it as true. That’s the thing about deception: sometimes it’s hard to spot, as small as uneasiness or something not sitting quite right.